Scholars, researchers, visitors and friends of the university or Redmond will find the EBR African American Cultural Life Digital Collection to be a vibrant trove of images spanning thirty plus years of major writers, scholars, artists, events, themes, and movements documenting black culture and life. One of the unique characteristics of the Collection has been Redmond’s ability to capture major figures in history and also the atmosphere of candid moments as well as everyday life. 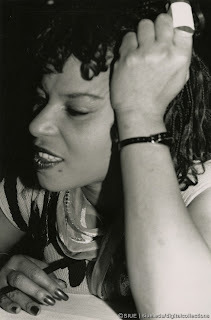 One of the images that stood out to me was of Ntozake Shange in February 1991. Here, she was seated with a pen in her right hand and leaning on a table with her left her hand on her forehead. She looks relaxed and in thought or conversation following what seems to have been a book/poetry reading and signing when taken together with three other images of her with the same date. Typically, we tend to limit our focus of writers and artists to their “textual” productions or representations, and very seldom are we able to see the “behind-the-scenes” thought processes, inner-workings, and manifestations of work, especially by capturing African American women and other women of color in non-derogatory images or spaces.